CALLING ALL VOLUNTEERS – WANT TO HELP GET THE WORD OUT ABOUT OUR 2017 LOCAL ELECTIONS? Come one, come all, this event is co-sponsored by Action Together Rochester, League of Women Voters and La Cumbre! The primaries are Sept 12, we will be reminding voters using stencils that say "Vote Tuesday" and "Vote Martes" with spray chalk on side walks in specific locations throughout the City of Rochester! We need volunteers who want to meet other activists and have some fun while making a difference. WE NEED YOU! We will be meeting at Ibero (817 E Main Street) Sunday, September 10 at 2:00 p.m. to collect supplies and get into teams! For more information, contact Milagros Concepción @ milagros.concepcion1@gmail.com! Hispanic eligible voters projected for 2016. The median age among the nation’s 35 million U.S.born Latinos is only 19. Student debt accounts for a $1.3 trillion burden to the US economy. Only 3% of Latinos voted in the last election in Monroe County. We are holding a nonpartisan Latino Voter Engagement Rally that will be held at 27 Zimbrich St. Rochester, NY 14621 (Site of the old #22 School) for all community members, but especially the Latino community. 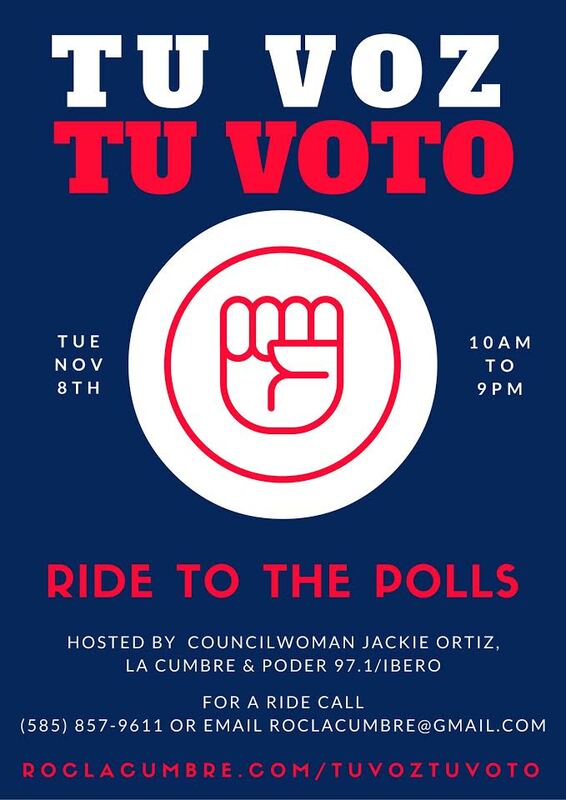 Poder 97.1 (affiliate of Ibero-American Action League) will broadcast live from the site and the goal is to be a festive one stop location for members of the community to check whether they are registered to vote, register to vote and/or get information and answers about the upcoming election. We have invited vendors and have asked them to attend the event and provide as many resources or giveaways to the families/ pedestrian traffic. More vendors are always welcomed. During the later part of the day, the fair will extended itself out to the community as groups of volunteers will do a door to door engagement and registration blitz. Jon Greenbaum, from Rochester ACTS, working with Miguel Melendez, from PROJECT HOPE, will lead a program door-to-door canvass into the community, providing lists of voters and households. The goal of this canvass will be to get current voters to engage in conversations about the community that are important to them, connections that encourage them to vote. For individuals, houses and families not on the list, volunteers will stop by those homes to encourage them to register to vote. The outcome of this activity will be voter pledge cards and sign ups for additional information.